A collection of tumblers of each place I visited during my one year of living in Japan. From left to right, Kyoto, Hiroshima, Shimane, Kobe, Fukuoka, Hokkaido, Nagoya, Osaka, and Kanazawa. My favorite, Shimane, the place I lived. 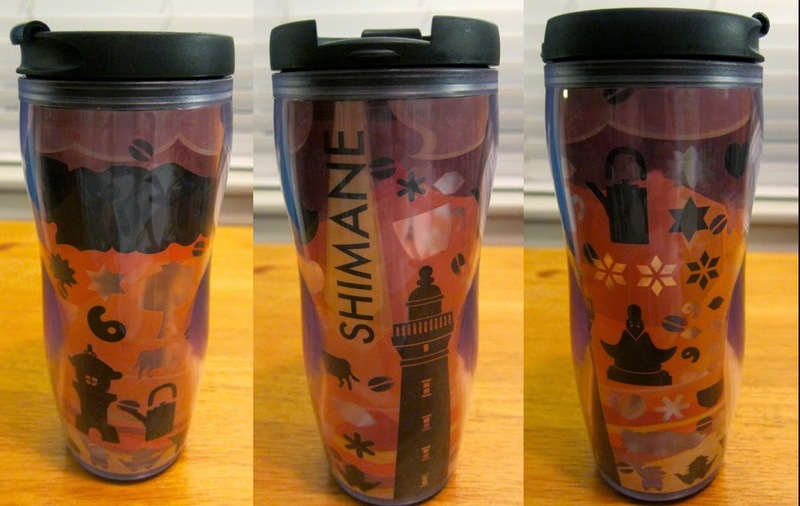 This limited addition tumbler was made for the March 2013 opening of the first Starbucks in Shimane, located in Matsue City. This particular Starbucks location have sentimental value to me, and is the setting of many memories. I was not one of the hundreds of people who waiting in line for this sold-out tumbler but I bought it unused for 1,000 yen off of someone who did. Every year around February Japan released a tumbler to celebrate the blooming of the cherry blossoms. The one on the left is from 2014, and the one on the right is from 2012. Labels: 2014, JAPAN, Starbucks, Starbucks Tumblers, What Do I Buy?